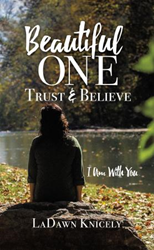 Within the pages of LaDawn Knicely’s new book, Beautiful One, ($20.99, paperback, 9781498488013; $31.99, hardcover, 9781498492720; $9.99, e-book, 9781498488020) readers will find hope for their lives even through their personal obstacles. LaDawn Knicely has a Master of Arts in Counseling and a Master of Divinity. She has served as a Pastoral Counselor and Resident in Counseling at Hometown Pastoral Counseling Group, PLC. She has also worked as a counselor at a shelter for abused women and their children, a chaplain/counselor at a male group home of formerly incarcerated felons, and a leader for teens in a conflict resolution program promoting peace and nonviolence. Xulon Press, a division of Salem Media Group, is the world’s largest Christian self-publisher, with more than 12,000 titles published to date. Retailers may order Beautiful One through Ingram Book Company and/or Spring Arbor Book Distributors. The book is available online through xulonpress.com/bookstore, amazon.com, and barnesandnoble.com.